Whenever a single pole-single throw (SPST) switch is used for input into high-speed digital devices, the only thing you can do is to wait out the bounce interval with either hardware or software delays (see Waveform 2). The individual application dictates the usefulness of this debounce method. Most applications can handle delays of up to 100 milliseconds with a barely noticeable delay. Method 3 is the hardware implementation for single pole - single throw switches. This circuit charges the capacitor C1 through Resistor R1 and Diode D1 when the switch is released, and discharges it through Resistor R2 when it is activated. 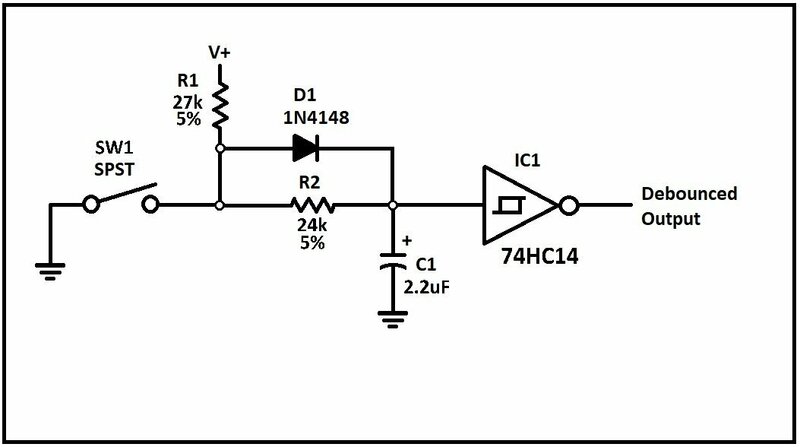 The 74HC14 Schmitt trigger IC provides the needed hysteresis for a snap-action output when the slow ramp of the RC circuit rises and falls. Hysteresis assures a single transition with no oscillation when the switch is activated or released. NOTE: The values shown in the drawing provide delays of approximately 36 milliseconds on activation and release with a 5 volt supply. The resistance of R1 and R2 may be raised or lowered for longer or shorter delay times.